Test Mode : Clip-on CT, Integral mode. Display Mode : Four Digit LCD display. show peak value during the course of testing. Data Hold : Display shows “DH” symbol. Overload : Display shows “OL” symbol. Operating Temperature -0*C ~ 40*C : below 80% R.H. Display Four Digit LCD display. 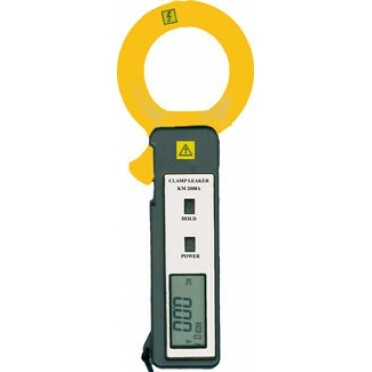 Features & Specifications :Leakage Current Clampmeter KM - 2008Sensing .. Features :Current Clamp Adaptor CA500CA500 Current Clamp is a transducer which will allow your multi.. Features & Specifications :Current Clamp Adaptor CA10001000A AC/DC Current Clamp Adaptor 400/100.. Features :Current Clamp Adaptor CA20002000A AC/DC Current Clamp Adaptor 400/2000A, O/P 1mV/ACA1000 C..